Richard H. Fay is an author, artist, and home school dad who resides in Upstate New York. He is inspired by medieval history, myth, and legend, and the classics of fantasy literature. His diverse and interconnected interests drive his artistic endeavour. 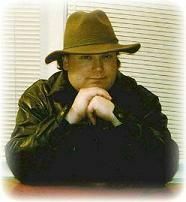 He writes fantasy prose and poetry, as well as dabbling in science fiction and horror. Recently he has decided to begin writing as more than just a sideline, although he has been writing seriously since the 1980s. Find more by Richard H. Fay in the Author Index.